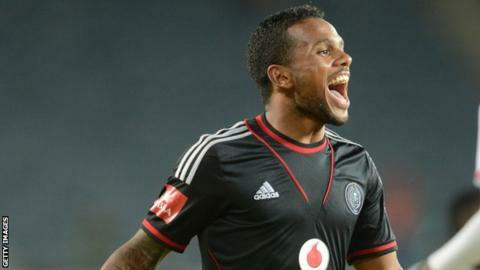 A Kermit Erasmus hat-trick enabled South Africans Orlando Pirates to brush aside Gabonese Mounana 3-0 this weekend and reach the African Confederation Cup play-offs. The 24-year-old striker, who spent two seasons with Dutch club Feyenoord, struck twice within five minutes during the first half. And he completed his treble, a rare feat for South Africans in Caf competitions, 11 minutes after half-time at Orlando Stadium in Soweto. While the first goal on 24 minutes was a simple tap-in off a low cross, the second was superbly executed as he rounded goalkeeper Yves Bitseki and netted from an acute angle. Erasmus went past Bitseki again to complete his hat-trick with a low shot and give the Buccaneers a 5-2 aggregate victory in the last-16 tie. Tunisians Etoile du Sahel are also through to the play-offs which take place later in May against the African Champions League last-16 losers, including Egyptians Al Ahly and Moroccans Raja Casablanca. But it was a struggle for the 2006 Confederation Cup title-holders as they overcame Tanzanians Young Africans 1-0 at Stade Olympique in Sousse. Defender Ammar Jemal scored the lone second-leg goal on 25 minutes to give Etoile a 2-1 aggregate victory. But the 10-man home side endured anxious second-half spells after Cameroonian midfielder Franck Kom was sent off for a second booking just before half-time. Fellow Tunisians Club Africain and Nigerians Warri Wolves have also qualified for the play-offs. Club Africain, who drew against ASO Chlef in Algeria in the first leg, won the return match 1-0 at Stade El Menzah. Imed Meniaoui was a constant threat to the visitors and scored the match-winner two minutes before half-time in Tunis. Warri Wolves made it through to the play-offs with a 1-0 win against MK Etancheite in the Democratic Republic of Congo to complete a 3-1 aggregate triumph in the last-16 tie. The goal came on 72 minutes when Oghenekaro Etebo finished a sweeping movement. It was the fifth win in six Confederation Cup matches this season for unbeaten Warri. Wolves eliminated Burkinabe Bobo and Ethiopians Dedebit in previous rounds and will feature in the play-offs for the first time after two second-round exits from the competition. On Sunday, the incredible run by Swaziland police football team Royal Leopards was brought to an end in Democratic Republic of Congo capital Kinshasa as AS Vita Club outclassed them to win 4-0, overturning a 1-0 loos in the first leg. The Congolese led 2-0 at half-time and a second-half brace from consistent scorer Firmin Mubele confirmed the dominance of the Black Dolphins. The anticipated comfortable passage to the play-offs for Ghanaians Hearts of Oak failed to materialise and they needed the away-goal rule to eliminate Malians Djoliba. Leading 2-1 from the first encounter in Bamako, Hearts could not extend their advantage and Djoliba deservedly took an 83rd-minute lead through Seydou Diallo. But the impressive Malians ran out of time and were eliminated - a fate that also befell compatriots Onze Createurs, who were knocked out by Ivorians ASEC Mimosas. Having lost 1-0 at home, Onze suffered a predictable 2-0 defeat in Abidjan. A Bangaly Soumahoro header after 10 minutes and a Karim Toure shot three minutes from time gave 1998 African champions ASEC victory. Egyptians Zamalek defeated Moroccans FUS Rabat 3-2, having been held at 0-0 at home. Branded 'toothless' by the media after that first leg of the last-16 tie, the Cairo White Knights became ruthless to achieve an impressive away triumph. Former Confederation Cup title-holders FUS must have fancied their chances of progressing when leading 2-1 with just six minutes left. But five-time African champions Zamalek finished powerfully with Omar Gaber equalising and Hazem Emam snatching a last-minute winner at Stade du FUS.